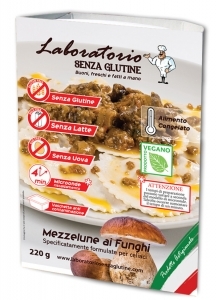 Mezzelune with mushroom sauce is a typical italian vegan recipe. This pasta is handmade with natural gluten free flour and no preservative. Mushroom mixture (champignon, porcini, shiitake, yellow gelon, prataiolo in variable proportion) 19%, tomato sauce, rice flour, potato starch, potatoes, champignon mushrooms 5%, porcini mushrooms 5%, extra virgin olive oil, sunflower oil, shallot, leek, guar flour (E412), parsley, salt, pepper, garlic.